Homemade Corzetti With Alfredo Sauce (vegetarian) | Red Wine, White Wine, Fine Food Too! It’s a cold, rainy, grey day. This is what I made for lunch. How lovely! Where is the recipe? It looks marvelous. You will need a corzetti stamp. Then the pasta is just 2 cups all purpose flour, pinch of salt, 3 eggs and 1/4 cup white wine. 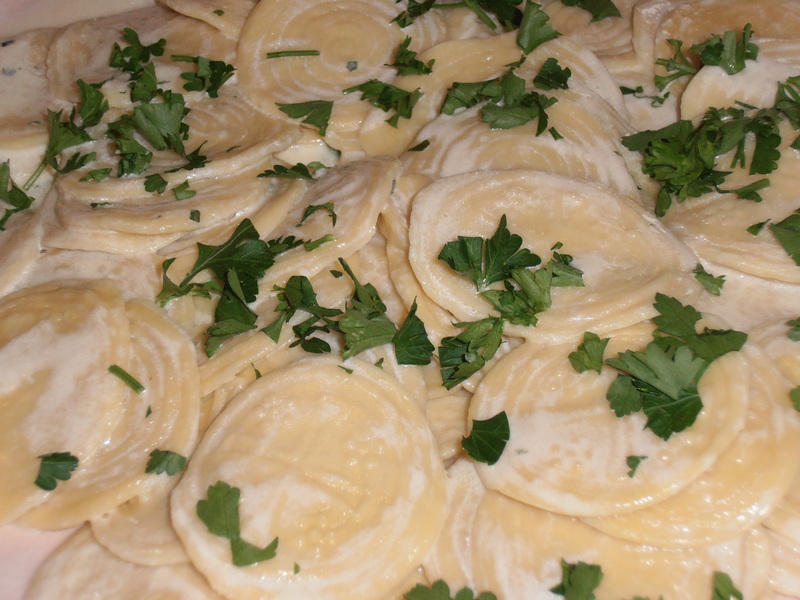 Blend into a ball as you would with any other homemade pasta, cover and let sit for 20 to 30 minutes. Cut ball into quarters and work one quarter at a time. (Cover the others while you work so they don’t dry out). Roll out either by hand or with pasta machine to about 1/16 inch thick. Cut and stamp your corzetti, put into boiling water and when they pop up to the top they should be done. Alfredo sauce recipe can be found anywhere. Garnish with fresh parsley!